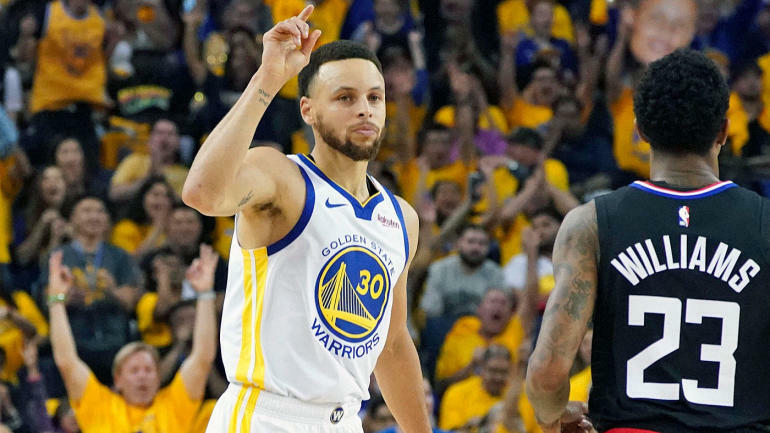 The opening weekend of the 2019 NBA playoffs is in the books, and what a wild few days it was. Three higher seeds — Denver, Philly and Toronto — lost Game 1 while the Blazers, not an underdog by seed but a team that nine of our 10 analysts picked to lose in the first round, took a 1-0 lead on the Thunder on the strength of huge efforts from Damian Lillard and Enes Kanter. Below are a handful of takeaways from each Game 1. Looking back, this should’ve been a bit more predictable than it felt. The Sixers don’t defend the pick and roll well, and the Nets are a top-10 great pick-and-roll team. Joel Embiid was not 100 percent and not himself. Ben Simmons has shown us that his inability to shoot is a much bigger problem in the playoffs than it tends to be in the regular season, and indeed he spent most of Game 1 getting in the way by doing pretty much nothing to the tune of nine points — most of which were at the end and pretty insignificant — on nine shots for a team-worst minus-21. Finally, for as solid a defensive team as the Sixers are from a metrics standpoint, they don’t have a plethora of one-on-one lockdown defenders outside of Jimmy Butler. Bottom line: The Sixers just couldn’t stay in front of the Nets, executed their five-wide thing to perfection, spreading the Sixers to their breaking point then just breaking them down with their multiple playmakers for finishes at the rim and drive-and-kick threes. Brooklyn had six guys score in double digits, led by D’Angelo Russell’s 26, Caris LaVert’s 23 and Spencer Dinwiddie’s 18. They hit 11 3-pointers to Philly’s three. The Nets only had 15 assists because, again, they were beating the Sixers one on one. None of this seems unsustainable for Brooklyn. The Sixers dropped their bigs on pick and rolls, and just in general, to invite mid-range shots, and Russell is not just going to stop making those. It’s his bread and butter. Dinwiddie isn’t going to stop getting to the rim. The Sixers can’t stay in front of him and he’s seriously one of the best drivers in the league. The Sixers don’t have the depth to chase around all of Brooklyn’s shooters. If Embiid can’t come back and dominate inside (which he should be able to do if he is healthy-ish) and perhaps get the Nets into some foul trouble, the Nets can beat Philly. Embiid shot way too many threes in Game 1, but again, a lot of this is the presence of Simmons, who doesn’t command a defender on the perimeter, so they put him down low which pushes Embiid out to the 3-point line. Everything Philly does is as much about getting around what Simmons can’t do as it is what anyone else can do. Jimmy Butler was terrific, and as Simmons becomes more and more of an anchor, Butler will have to carry more and more of the offensive load, not just from a scoring standpoint but also from a playmaking standpoint. I don’t want to jump on the Game 1 panic boat, but this was not a fluke. Brooklyn can beat Philly three more times. Whether they will, who knows. But they certainly can. Holy upset. No this was unexpected. But again, perhaps it shouldn’t have been. Toronto didn’t look great down the stretch while the Magic were one of the league’s best teams after the All-Star break. Kawhi Leonard was very good, but he didn’t fight hard enough over a screen, and instead stayed with the screener, on the game’s deciding play, allowing D.J. Augustin — who finished with 25 points and six assists — to step into the game-winning 3-pointer with 3.4 seconds left. Augustin completely buried Kyle Lowry in their point guard matchup. Lowry finished with … wait for it … zero points on seven shots. Yes, he was a plus-11 for the game with eight assists and seven rebounds, which is a perfectly good example of why you should never rely on stats to tell your story, particularly advanced stats. That plus-11, plain and simple, was a product of circumstance. Lowry has to be worlds better if Toronto wants to make this series reasonably easy from this point forward, let alone if they have designs on competing for a championship. This playoff Lowry thing is, like, a thing. And it ain’t a good one. He has good games and/or series here and there, but his absolute playoff disappearance is lurking every single minute. Not much to say here. Stephen Curry was brilliant, and the Warriors are just way better than the Clippers. This will be a very quick series. Curry had 38 points on some typically ridiculous shots — 8 of 12 from three — but it was his defense and … 15 rebounds!!! … that really stood out. He was “best player in the world” Stephen Curry in every area of the game, and when Draymond Green, the guy who is always going to be a wide-open release valve, is going 7 of 12 for 17 points on top of Curry lighting it up, forget about it. The Warriors looked terrific. For a 2-7 matchup, this feels a lot a coin flip, doesn’t it? The Nuggets didn’t play poorly. They shot poorly, particularly from three, which was a problem all down the stretch of the regular season; but they didn’t play poorly. They made big shots/plays for a team that is largely devoid of playoff experience. They didn’t crumble, as would be the easy narrative for a No. 2 seed dropping Game 1 at home. The Spurs are a good team. They took away a lot of Denver’s off-ball movement, or at least never let it really open up. Nikola Jokic had a triple-double with 14 assists, 14 rebounds and 10 points, but I think he needs to attack more as a scorer for Denver to make real headway offensively. The Spurs are going to make that tough for him to do. They consistently sent multiple bodies at Jokic, trapping him and harassing him mercilessly, when he touched the ball, and while he did respond with the assists, his 20 points a game average is a big part of Denver’s offense. Jamal Murray and Gary Harris are not a “carry the bulk of the scoring load every night” type of backcourt. Also, the 14 assists Jokic piled up really wasn’t THAT big of a number for as much as Jokic was being forced to move the ball. Harris and Murray combined for 37 points but they also shot a combined 15 of 36 from the field, including 1 of 9 from three. Murray had a wide-open look to put the Nuggets ahead with just over 10 seconds to play, but couldn’t cash it in. Then he had the ball stolen from him with Denver trailing by three and looking for a game-tying shot as the final second ticked down. Welcome back to 1990s Eastern Conference basketball. En route to their 74 points, the Pacers scored just eight third-quarter points — they didn’t make their first bucket until over eight minutes into the quarter — to go from a seven-point halftime lead to an 11-point deficit entering the fourth. Indiana is going to struggle to score in the playoffs with Victor Oladipo, but give Boston credit. They defended hard. Kyrie Irving took the challenge on that end. The Celtics’ energy trickled down from him, which is the way it’s supposed to be with your best player. I think this was the perfect way for Boston to start the playoffs. I know they didn’t score a lot themselves, but the energy and buy-in, and the chemistry that creates, is what comes and goes with this team. They have a ton of playmakers and shooters. They’ll be in every game if they play as passionate as they did in Game 1, and after that, you take your chances with all those capable scorers and shooters. Good start for Boston. Portland snapped a 10-game playoff losing streak, which is almost hard to believe. Enes Kanter!!! Dude was incredible with 20 points and 18 boards. He played his you know what off every second he was on the court, and without Jusuf Nurkic, the Blazers needed all of it. This was a great pickup by Portland. Zach Collins can do some things, so can Meyers Leonard once in a while, but Portland flat out needs numbers in Nurkic’s absence. They need points. Boards. Actual big time tangible production rather than just a guy playing his role decently. Kanter getting numbers is not a new thing. His defense can be awful. We all know that. It wasn’t even close to awful in Game 1, but it could go there at any point. But he’s always been able to get numbers, and that takes a lot off Damian Lillard and C.J. McCollum. Speaking of Lillard … my man. When is this dude going to get the superstar credit he deserves? How is he not in the thick of the MVP conversation every single season when he pretty much single-handedly keeps this relatively pedestrian roster – OK, maybe that’s an exaggeration, but this is not a great roster by any stretch — in the top four-ish of the West year in and year out? Lillard was a complete stud, again, in game 1, netting 30 points on 5 of 11 from three. For him, those aren’t crazy numbers. But it was the depth of the shots, and the point in the game they came at, that made this performance so special. Lillard was criticized endlessly after the Blazers got swept in the first round last season. He wasn’t going to let the Blazers lose on Sunday. How many other players just pull the trigger on this shot with 12 seconds still on the shot clock in a one-point playoff game with under three minutes to go? That is some no-conscience stuff right there. It’s also a major mistake by Russell Westbrook. Lillard was hitting deep threes all game. He’s been hitting them for the last four years. There is no way you can give him that kind of space — especially at that point in the game, I don’t care how far out he is. You pick that dude up in the huddle. Paul George not being himself is a major problem for OKC. George said he could hardly lift his arm in the days preceding Game 1, then he went out and shot 4 for 15 from three. The Thunder simply don’t have enough offense, or certainly enough shooting, when George isn’t going off. They depend on him so heavily. If he gets back to the player that was, at one point, a legit MVP candidate, OKC will make this a series. If he doesn’t, Portland is going to move on. Nine out of 10 of our experts picked the Thunder to move on here. One picked the Blazers. Who is that bold guy? Break out the broom. This one’s going to be a sweep. Blake Griffin didn’t play in Game 1, but even if he had, the Bucks are just way too good for Detroit. This is even more lopsided than Golden State-Clippers. Read here about some of the problems Milwaukee might run into in later rounds, but they are cruising in this series. Boston better make quick work of Indiana, because the Bucks are going to be plenty rested in Round 2. The Jazz feel a bit like the Pacers in that it’s hard to imagine them scoring enough points to compete in their first-round series. The best thing for Houston: This did not feel like a taxing game. It could well be a pretty smooth series. Harden put up 29 points, 10 assists and eight rebounds and only had to play 33 minutes. That is big. A lot of people think the Rockets got a tough draw ending up as the No. 4 seed, which likely means having to play the Warriors in the second round rather than the conference finals. Quietly, I think that’s a good thing. For starters, a 3-6 matchup with OKC would’ve had the potential to be a much tougher, more drawn-out series for Houston that I think this Utah one will be. And besides that, getting Golden State one round earlier means James Harden will be one round fresher. To upset the Warriors, Harden will have to be hugely productive and play 40-plus minutes in every game. Fatigue is a real factor for a guy that has to carry that kind of load. It certainly was last season when Harden visibly didn’t have much juice left — if any at all — by the end of Game 7 of the conference finals. It’s important that Houston take advantage of this opportunity and make quick work of the Jazz, because you know the Warriors are going to cruise through the first round without breaking a sweat.